About to set off on a flight with your little darlings? Filled with joy at the idea of a long plane trip, mucked up sleep patterns & a hyperactive 2 year old contained to a seat? Not so much? Read on for my top tips for travelling with children! You know those children who you see sitting in cafe’s colouring in and playing quietly? Yeah, well those are not my kids. Ever. I have two boys. Two young boys. Two very busy, very active boys. Keeping my kids quiet and occupied takes a whole lot more than some colouring in books and a bit of food. Keeping my kids quite requires military style planning, a magicians bag of tricks and quite a bit of luck. These are the tips for travelling with children I have learnt along the way. Ideally you want to board the plane at a time when your child is awake and not too tired. Trying to get through an airport and onto a plane with a tired/asleep child is not easy. I used to think it would be ideal to get on a plane right as they were ready for a nap. I was WRONG! Planes get delayed, take off takes time, the hour before nap time is generally hell and travelling through an airport at this time is a nightmare. My best experiences have been when flights took off during their awake time and they were due for a sleep a couple of hours in. This gave me time to get them settled, feed them, entertain a bit and then have the excitement over before they were ready for a nap. My love of my carriers is no secret to my friends and family. I have a slight addiction and have a few… ok, more than a few. Never have I loved my Manduca or Ergo more than when at the airport. On a trip to Queensland when my second son was about 4 months old I actually had my oldest (3 at the time) on my back & my youngest on my front in two separate carriers. It made life so much easier. Just be aware that they will make you take bub out going through security and on takeoff and landing. It is easy to forget to keep kids hydrated and fed when travelling. A hungry child is a grumpy child. Don’t rely on airlines to have food your little cherubs will eat. Bring stuff you know will keep them happy. These are wonderful inventions!! They are little earplugs that go into your children’s ears before landing to make the descent less painful for their little ears. You can buy them at the chemist. Sucking on a lolly pop, a dummy or nursing can also help. If you know your child has a lot of trouble with their ears on landing, consider whether you should give them a pain killer 30-60 minutes before landing. My son screams in agony when landing no matter what techniques I use so I always give a little panadol before landing to take the edge off. Younger children will be comforted by a breast or bottle feed. iPads and DVD players are NOT evil! They are your friend. Use them. Load them with Peppa Pig or In The Night Garden or whatever other rubbish will keep your child happy. Now is not the time to play parent of the year. If they will watch 4 hours of tv, great! Do it! I know, I know. You’re meant to stay in your seat, not disturb the other passengers blah blah blah… when it is safe, get up and go on a treasure hunt. You can prepare things to look for and take photo’s of ahead of time. Send them searching for green shoes, clouds that look like a sheep, a curtain, the toilets etc etc. Get them to hunt and take photos of what they find. They get a stretch and move about and it can take a good 30min to find everything. Do you have a semi recently toilet trained child or one that you know can’t “hold on” for extended periods? Put them in pull ups for take off and landing. It can take quite some time to get going and if your child needs to go it may just not be possible. I learnt this the hard way. This is always quite a hit with my older son. We make shapes, animals, stick things in it, make pretend glasses and generally have fun. It is actually not that messy if you use it on the pull down table. Do your kids have a super favourite toy? See if you can hide it for a few days or a week leading up to your flight and then bring it out when on board! Obviously this isn’t going to work if their favourite toy is a giant digger or a singing doll but it might work for smaller/quieter items. You don’t want to be digging through a nappy bag trying to find the wipes or a dummy or the bag of matchbox cars you packed. Pack everything so it is easily accessible. Pack a little take off bag so stuff you need for take off and landing is ready to go until you can access your stowed bags. If you are travelling with someone else, take turns with the kids. Having even 5 minutes alone (in the toilet if you have to!) is enough to recharge you. Take turns to eat your meals, swap kids etc. Try to share the load. 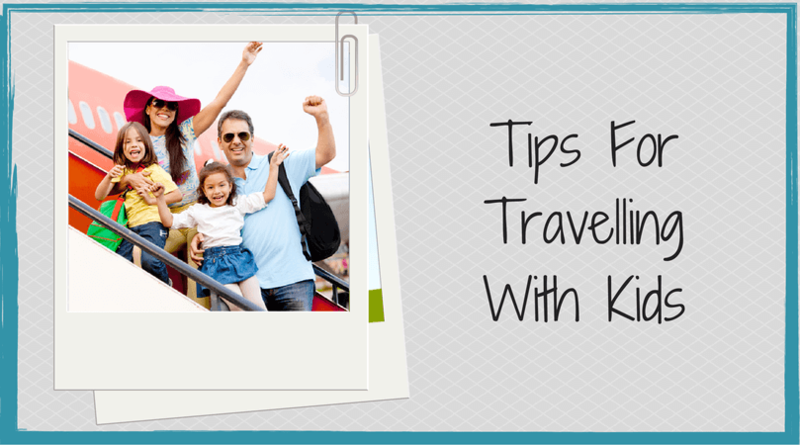 What other tips for travelling with kids do you have? Share them in the comments below.